Autoimmune polyendocrine syndrome type 1 (APS 1) is a rare autosomal recessive disorder that is characterized by autoimmunity against endocrine and ectodermal tissues. Clinical manifestations usually appear in childhood and consist of hypoparathyroidism, oral candidiasis, and adrenocortical insufficiency. Ocular complications include keratoconjunctivitis, dry eye, iridocyclitis, cataract, retinitis pigmentosa, and optic atrophy. We report a 9-year-old girl with APS 1 who had polar cataract in her left eye (LE), retinal changes with retinal pigment atrophy, and a new autoimmune regulator (AIRE) gene defect on chromosome 21. When a pediatric patient presents with decreased visual acuity with a history of chronic mucocutaneous candidiasis, ectodermal dysplasias, or hypoparathyroidism, we should consider the diagnosis of APS type 1 and arrange a pediatric endocrinological evaluation. The gene studied in this case may contribute to the characterization of the molecular pathology of the AIRE gene and may allow preclinical diagnosis in families at risk. Here we report a novel AIRE gene mutation in a patient with rare ocular findings and symptoms of hypoparathyroidism, mucocutaneous candidiasis, ectodermal dysplasia, and pernicious anemia. 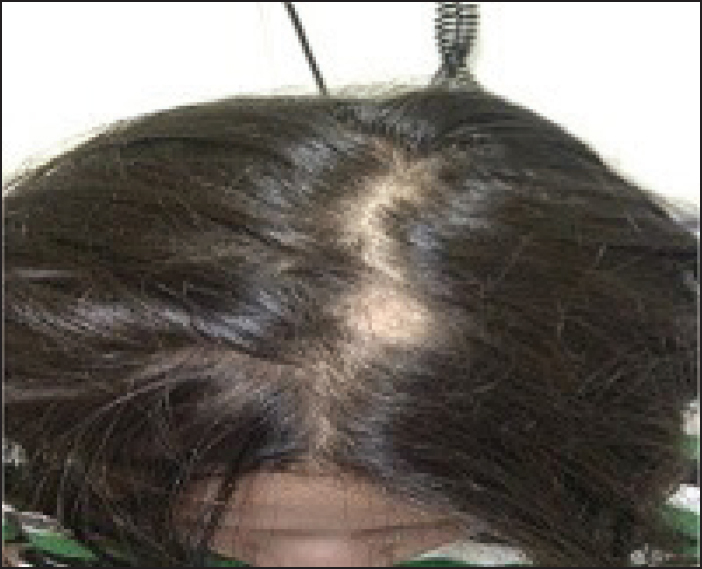 A 9-year-old female was admitted in the hospital because of alopecia. 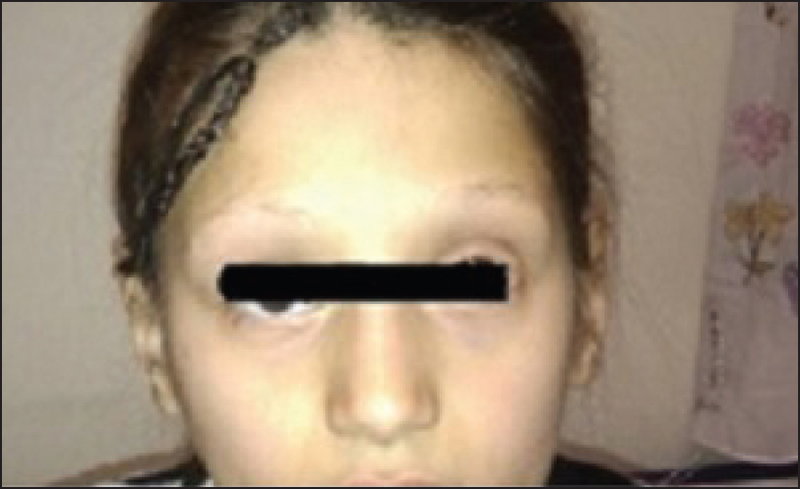 She had multiple minimal local alopecia and bilateral loss of eyelashes and eyebrows [Figure 1] and [Figure 2]. 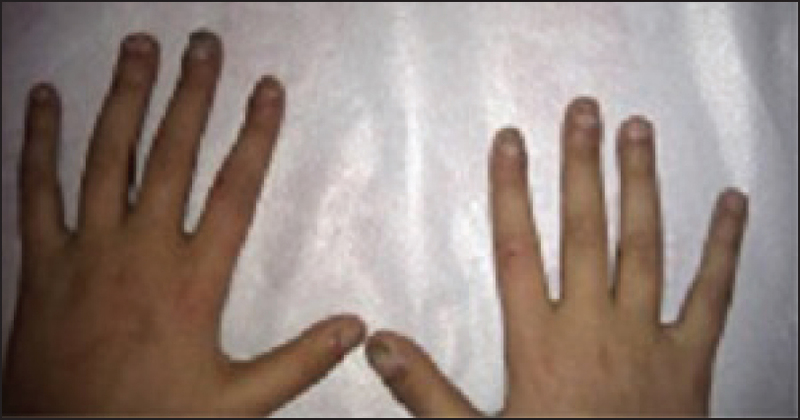 She had oral candidiasis and ectodermal dysplasia and ectodermal dystrophy of nails, but did not have vitiligo [Figure 3]. The patient was the first child of first-degree consanguineously married Turkish parents. The pregnancy and birth were uneventful. There was nothing significant in the family history. In history, it was learned that 1 year ago, she was admitted to another hospital for lethargy and convulsions. The diagnosis of hypoparathyroidism was made and subsequently, she was put on calcitriol and calcium therapy. There was history of intractable diaper dermatitis and recurrent oral candidiasis during her infancy. The patient's laboratory examination at presentation: Serum calcium: 9.1 (9-10.8) mg/dl, phosphate: 6.3 (4.5-5.5) mg/dl, parathyroid hormone: 1.2 (11-75)pg/ml, glucose: 94 (70-100) mg/dl, renal, hepatic functions, and electrolytes were normal. She was diagnosed as megaloblastic anemia with vitamin B12 level: 34 (126.5-505) pg/ml, hemoglobin:11.6 g/dl, and mean corpuscular volume (MCV):102.3 Fl. Thyroid and adrenal gland function tests were normal. Upper endoscopy, performed for pernicious anemia, demonstrated endoscopic and histological evidence of gastric atrophy. She was seen in ophthalmology department due to complaint of blurred vision. Her best corrected visual acuity was 20/50 right eye (RE) and 20/50 left eye (LE). Intraocular pressures were normal (12 mmHg RE and 14 mmHg LE). 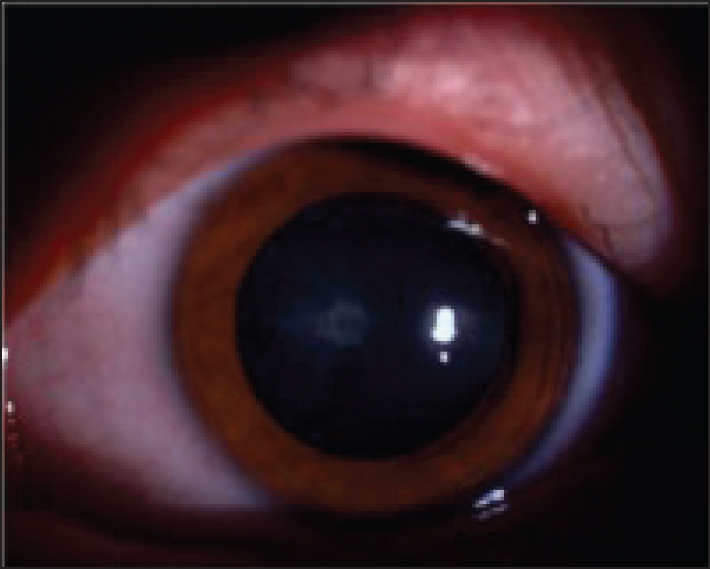 Slit-lamp examination showed a posterior polar cataract in the LE [Figure 4]. 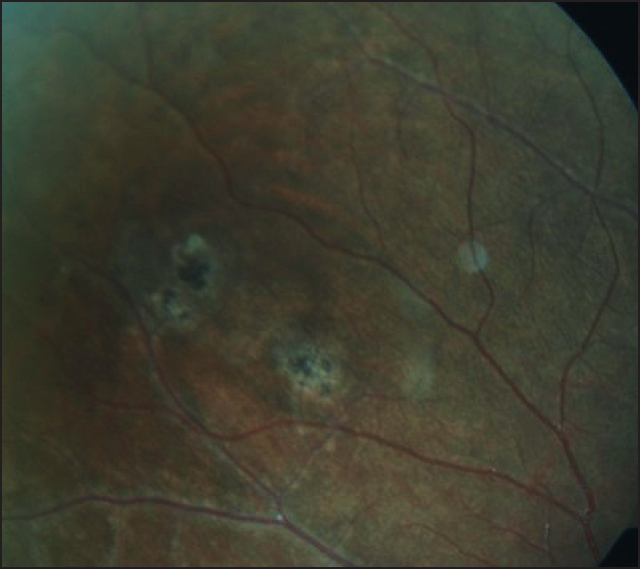 On ophthalmoscopic examination, there was a vitreous degeneration at RE and bilateral atrophy of macular retinal pigment epithelium, peripapillary hyperpigmentation, and diffuse hypo-hyperpigmented areas [Figure 5]. Her fundus angiography demonstrated window defects consistent with the atrophic areas of retinal pigment epithelium [Figure 6]. Surgery was planned for cataract. Calcium and calcitriol treatment was continued. For determination of AIRE gene mutation, genetic analysis was performed. Blood samples were obtained after written informed consent from the parents. The screening of the entire coding regions of the AIRE gene in patient's DNA led to the identification of a homozygous 9 bp deletion in exon 2 removing three amino acids: C.267-275del (p.Tyr90-Arg92del) [Table 1]. This mutation has not been previously reported. 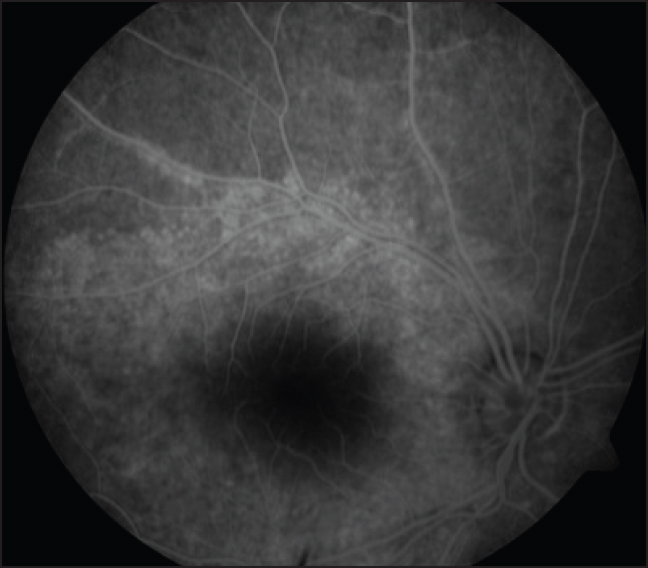 Two cases with APS1 were reported to have retinitis pigmentosa. , Our patient had retinal pigmentary changes with pigment epithelial atrophy. Family history of inherited retinal abnormalities was however negative. Since APS1 is an autoimmune syndrome, we hypothesized that atrophy of the retina in the presence of autoantibodies directed against these tissues suggests that retinal findings are autoimmune and part of the syndrome. In conclusion; when a pediatric patient presents with decreased visual acuity with a history of chronic mucocutaneous candidiasis, ectodermal dysplasias, or hypoparathyroidism; we should consider the diagnosis of APS1 and confirm the presence of this unique AIRE gene mutation on molecular basis. Betterle C, Greggio NA, Volpato M. Clinical review 93: Autoimmune polyglandular syndrome type 1. J Clin Endocrinol Metab 1998;83:1049-55. Ahonen P, Myllarniemi S, Sipila I, Perheentupa J. Clinical variation of autoimmune polyendocrinopathy-candidiasis-ectodermal dystrophy (APECED) in a series of 68 patients. N Engl J Med 1990;322:1829-36. Chang B, Brosnahan D, McCreery K, Dominguez M, Costigan C. Ocular complucation of autoimmune poliendocrinopathy syndrome type 1. J AAPOS 2006;10:515-20. Nagamine K, Peterson P, Scott HS, Kudoh J, Minoshima S, Heino M, et al. Positional cloning of the APECED gene. Nat Genet 1997;17:393-8. Meloni A, Perniola R, Faa V, Corvaglia E, Cao A, Rosatelli MC. Delineation of the molecular defects in the AIRE gene in autoimmune polyendocrinopathy-candidiasis-ectodermaldystrophy patients from southern Italy. J Clin Endocrinol Metab 2002;87:841-6. Merenmies L, Tarkkanen A. Chronic bilateral keratitis in autoimmune polyendocrinopathy- candidiasis-ectodermal dystrophy (APECED). A long term follow-up and visual prognosis. Acta Opthalmol Scand 2000;78:532-5. Rajendram R, Deane JA, Barnes M, Swift PG, Adamson K, Pearce S, et al. Rapid onset childhood cataracts leading to the diagnosis of autoimmune polyendocrinopathy- candidiasis- ectodermal dystrophy. Am J Ophthalmol 2003;136:951-2. Gass JD. The syndrome of keratoconjunctivitis, superficial moniliasis, idiopathic hypoparathyroidism and Addison's disease. Am J Ophthalmol 1962;54:660-74. Wood LW, Jampol LM, Daily MJ. Retinal and optic nerve manifestations of autoimmune polyendocrinopathy-candidiasis-ectodermal dystrophy. Arch Ophthalmol 1991;109:1065. Vogel A, Strassburg CP, Obermayer-Straub P, Brabant G, Mann MP. The genetic background of autoimmune plyendocrinopathy-candidiasis-ectodermal dystrophy and its autoimmune disease components. J Mol Med 2002;80:201-11.